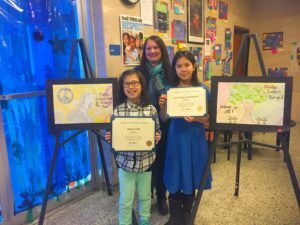 School 14 students took the top prizes for their submission to the 2017 Alan Lubin Poster Contest, held in conjunction with Siena College’s Martin Luther King Jr. Celebration. Twenty-four judges include NYSUT Secretary Treasurer Martin Messner; VP Paul Pecorale and Albany County Central Federation of Labor (ACCFL) President Bill Ritchie. It was a blind judging in the NYSUT lobby without identifying students or school. Congratulations to 1st prize winners Satya Groff and Irene Nguyen-McDowell, and to 2nd Prize winner Natalie Leveille. The students will receive their prizes during the School 14 Morning Program on January 26.